Dr. Ryan Gunn was born and raised in Cedar City. He has many fond memories of his childhood and school years and has always looked forward to raising his own family here. After attending SUU, Ryan got his dental degree at one of the oldest dental schools in the nation, Temple University in Philadelphia, PA. Living on the east coast and enjoying the beautiful and very different landscape there, it gave him an even greater love for the desert and his home back in Cedar City. Dr. Gunn loves taking his 4 kids and wife any chance he gets to play in the beautiful surroundings of Southern Utah. Whether he is exploring, biking, hunting, or just hanging out with friends camping he at his happiest. Dr. Gunn loves working in the field of dentistry. Nothing makes him more pleased than to see a patient who has come in nervous to see the dentist or maybe hasn’t seen the dentist for years and be able to see the change in their life after receiving the dental care that gives them their SMILE back. 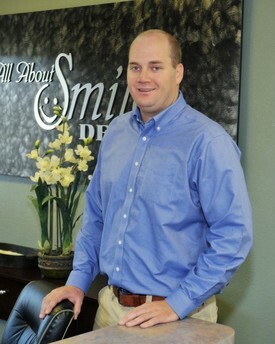 Dr. Gunn is confident that he will make your dental visit one where you look forward to your next dental visit.